What instruments do you own/play? Oppo, as I further challenge myself by learning new instruments, I can’t help but wonder if there are any other opponaut musicians out there. What instrument(s) do you play? What instrument(s) do you own but don’t play? And for kickers, what instrument(s) would you like to learn how to play? I’ll go first. Between my wife and I, we have enough to start a folk or bluegrass band. 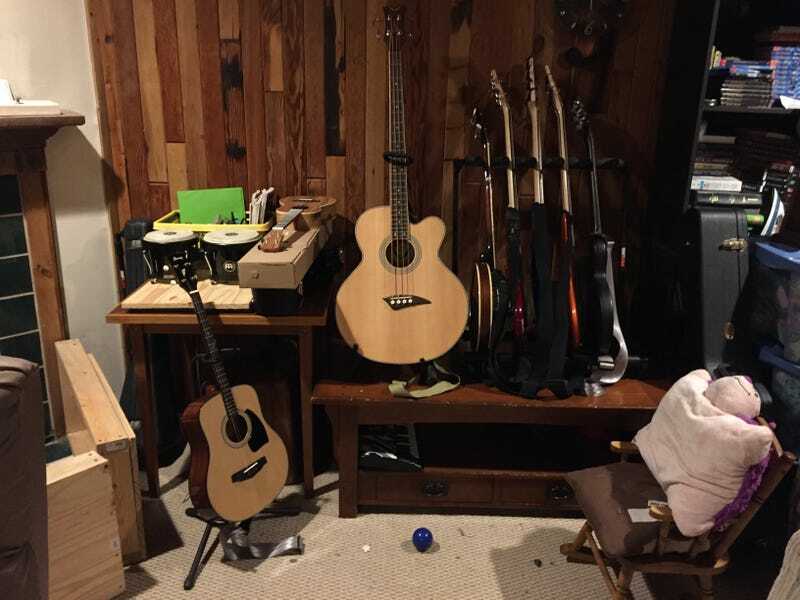 We have a few bass guitars (electric and acoustic), a few guitars (electric and acoustic), a tenor guitar, a couple ukuleles, a mandolin, bongos, a dulcimer, a accordion, and a banjo. I can only play the bass, tenor guitar, the ukulele, and banjo; while MrsZtp plays the dulcimer and guitar and is learning the mandolin. I want to learn the accordion but it really is a bit too complex for me currently. Though I’d love to learn any kind of folk instrument, I love the timbre and sound of folk instruments.